The purchases will help accommodate growing travel demand by congressional officials. The planes augment a fleet of about two dozen passenger jets maintained by the Air Force for lawmakers, administration officials and military chiefs to fly on government trips in the U.S. and abroad. The congressional shopping list goes beyond what the Air Force had initially requested as part of its annual appropriations. 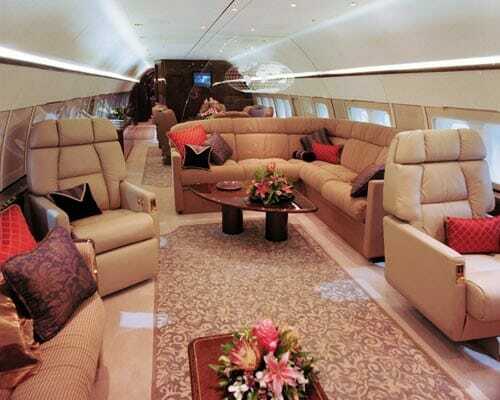 The Pentagon sought to buy one Gulfstream V and one business-class equivalent of a Boeing 737 to replace aging planes. The Defense Department also asked to buy two additional 737s that were being leased. Lawmakers in the House last week added funds to buy those planes, and plus funds to buy an additional two 737s and two Gulfstream V planes. The purchases must still be approved by the Senate. The Air Force version of the Gulfstream V each costs $66 million, according to the Department of Defense, and the 737s cost about $70 million. Even the richest of private companies blush at the prospect of buying Gulfstream V jets, the absolute top of the line in business jet luxury. Except, of course, for the ridiculously oversized Boeing Business Jet, of which Congress appears to be buying 3 (the BBJ is the business version of the 737). I am sure there is one, but I can't think of a single Fortune 500 company, and I have worked for and with a lot of them and flown on their jets, that has even one BBJ. I can understand why certain officials need to fly private planes just for security, but the average Congressman from Wyoming? Why won't commercial work. Andy why, if they must have a private plane, wouldn't a more reasonably sized Falcon 50 or Citation work just as well? Update: Several people have found it ironic that the White House threw a fit over $300+ million for funding of new warplanes but hasn't blinked over $500+ million to ferry Congress around in luxury. Update #2: An example of the BBJ. This is how you fly, right?